As someone who thinks a lot about social media marketing strategy, I have to observe what other fashion companies are doing on Instagram. In general, most brands stick to a few general rules, which include posting an update once a day, being informative, and presenting the most beautiful imageries that appeal to their audience. Think Prada, Gucci, Nike, Zara. The constant aim for perfection in social media content is a priority. Not for Balenciaga however. Since last year, the brand is now considered a meme page. Hardly any of the images are well-lit, well-focused nor well composed, at least not by industry standards. Gone are any semblance of opulence, nor Leibovits-tier aesthetics that people have come to expect from a luxury brand. Instead it looks like a private account of someone who parties at Berghain, only has coke and two year-old cheese in his fridge, often stays awake for 48 hours straight, and probably doesn't know where he will live a month from now because he had spent his pay check on wine, makeup and three pairs of thrifted lurex pants to match his 90s dad sneakers. It is however, highly engaging. The constant shitposting of low quality, off-the-cuff selfies-tier images are getting people worked up and passionate about the brand. For a luxury brand that has 3 million followers, getting almost 1% number of likes is far higher than the average number its contemporaries are getting. In comparison, Gucci, Prada and Nike receive an average of 0.3%, a measly third of Balenciaga's engagement. The plunge into this aesthetics reminds me of Instagram's users back when the app was in its infancy. People were taking selfies with their potato-quality camera phones. There was a sense of authenticity and imperfection that the audience can relate to. That was ten years ago. Influencers now have professional photographers tailing them to take beautiful images because that's what their audience respond to the most. However it comes at the expense of spontaneity and genuine experiences. Instagram is almost a decade old now. The constant search for perfection is perhaps no longer relatable to young yet jaded Instagram users that are growing immune to staged imageries. Make no mistake. The social media team knows exactly what they're doing. Amidst the badly composed shots - which in actual fact are actually highly contrived and calculated to look bad - are Balenciaga's signature tailoring, knife heels and neon spandex that Demna champions. They know exactly what the internet savvy Gen-Z wants: cats, shoes, irony and some semblance of post-modern authenticity. Even if they have received flak all over the Internet - yours truly is certainly not a fan of this marketing direction - the younger crowd fell for the meme-bait hook, line and sinker. 65% of sales came from the young Millenial crowd. On the streets of Shanghai, the young and old are wearing the Triple S regardless of its authenticity. Under Demna Gvasalia, interest for Balenciaga has risen sharply, thanks to the hype machine he has created. Its bad taste aesthetics is perfectly in line with Balenciaga's strategy in glorifying banal goods - think IKEA blue bags and canvas touristy totes, slapped with recognisable logos. The total disregard for any rules of photography that compromises the brand's luxury positioning has worked in their favour. Balenciaga has seen a sharp rise in interest all over the Internet, with sales figures to back it up. Although the social media marketing team may have resorted to a genius differentiation move, the longevity of its strategy remains to be seen. If a brand is built on explosive hype to appeal to consumers with short attention span, it's very likely that their interest will soon dissipate and they will have to constantly reinvent the wheel to remain relevant. Some weeks ago I turned 31, marking an ever closer milestone to a decade-long dive into the universe of Comme des Garçons. On the day of my birthday, I wore a suit from my favourite collection - the Infinity of Tailoring. It represented the perfect balance of whimsy and romanticism that meets pragmatism, comfort and practicality delivered with absolute precision in pattern drafting and cutting. The suit - and two other matching suit sets that I have with me - are part of a small Comme collection that is left in my possession, and have remained with me for six years. As my business grows, the opportunities to wear outré clothes has inversely dwindled to almost nothing. Most days are spent lugging my laptop, gym gears and clothing samples all over the city. Wearability takes precedence. The subject of wearability has sparked many heated debates across forums and comments sections. But in the world of Comme, I would define wearability to mean being able to lift my arms, while carrying some type of bag on my shoulders. Shortly after this FW2013 collection, Rei Kawakubo launched a full-scale rebellion against wearability that lasted for five years. If it wasn't for the models' heads and feet protruding, the clothes could easily be mistaken for moving sculptures. 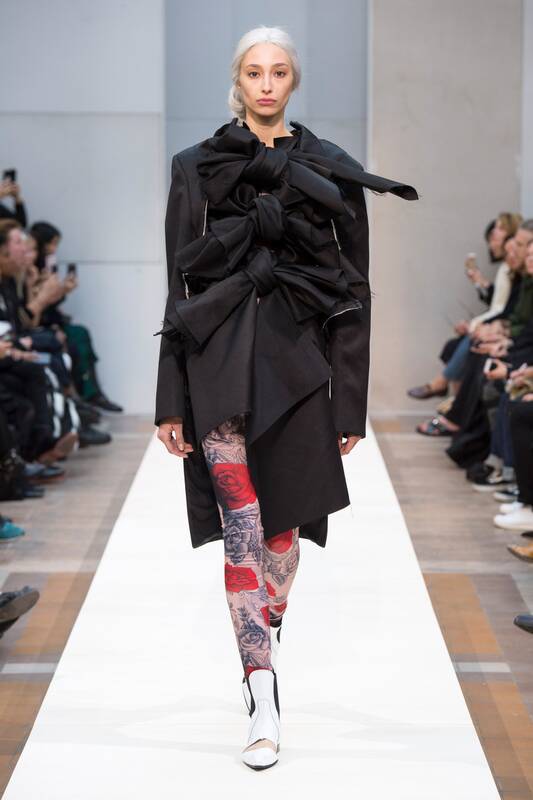 Noone questions why Rei Kawakubo went down this direction, and even if some of them tried, she would never give a proper answer. She no longer bothers to. Every year, she gives less interviews, and for every question her answer grows shorter. Not that anyone would ever complain. She is such a revered name in fashion that she is the first living designer to have an exhibit done in her honour in the Met Museum. By then, she would have been making clothes for almost five decades. Very few names in fashion can boast such legacy. The constant search for something new, abstract and unthinkable drove Rei Kawakubo to where she is today. When it comes to designing garments, we are constrained by the human anatomy. For any designer with less than twenty years of experience under their belt, that gives room for a thousand and one permutations. By her thirtieth year in fashion, Kawakubo-san has moved beyond garment design to redefining the metaphysics of beauty and clothing. She introduced the concept of wabi sabi to Paris (1983), deconstructed gender through suitings (1992) and deformed the human body (1996). Eventually that too gets old (by her standards), and she shifted to a new horizon to address the most basic question of all - what makes clothes, clothes. Rei Kawakubo was not the first person who attempted to address that question. Final year fashion students have the luxury to push boundaries of clothing because they have no reputation nor finances to lose. It's the kind of freedom that established fashion houses do not possess because they have sales quotas to meet. Not for Comme des Garçons however. As a privately held company, Kawakubo-san has no Arnaults nor Pinaults to answer to. And thus she is free to do as she wishes. Unlike fashion students, she commands an army of the most skilled pattern makers and cutters, with advanced production capabilities in Japan. It was only a matter of time before her persistence with abstraction rubbed off on other designers, or dare I say, give them the courage to do their own versions of 'not clothes'. By the fourth or fifth season, critics no longer raised their collective eyebrow when she sent another 'not clothes' collection. Then all of a sudden, the music stopped. Ahead of the Comme des Garçons fall/winter 2018 show, an announcement had been emailed by Kawakubo’s husband, Adrian Joffe, saying that she was ceasing her 10-season practice of challenging boundaries of fashion by showing abstract forms. Her clothes had sleeves again. The wearers can move their arms once more. Fashion on its most basic, mainstream level is a signifier of one's sexuality nested on a spectrum of dominance and submission. We can simply look at the most popular red carpet events such as the Oscars or BAFTAs to gauge what's considered sexually attractive for men and women. Taken down several notches, their outfits are a reflection of what the majority of the population will wear on a special night out, in the office environment or any setting that involves social interactions. The world of designer fashion, however shuns mainstream judgment aside for an hour every season to revere Comme des Garçons - the brand that makes people look unsexy, unglamorous and and in many instances, non-human. Luxury is often equated with excess wealth and indiscriminate consumption. And then there's also Veblen's definition of luxury - which is to be so rich that one barely has to work; I'm imagining lunching ladies in Lanvin who can change outfits five times a day. Perhaps Comme des Garçons represented the highest form of luxury, which is to be in a position where one does not feel insecure or threatened - physically and mentally - when going against cultural norms. I am by nature a visual person, so plucking ideas from personal experiences and turning them into clothes is by far a much easier process than writing. As long as I am emotionally positive, I can envisage a garment - a seam here, a lining there, and pockets everywhere. Writing is a completely different process. I have to be mentally calm to string words together, no matter my emotional state. If anything, melancholy propels me. I am most prolific when immersed in gloomy solitude. A dark winter morning, a long transit in the airport, an empty cafe, a long walk home. Melancholy is by no means a positive emotion. It is rooted in sadness and loss, sometimes a sense of longing for something that's missing. Brian Eno and Ryuichi Sakamoto encapsulates this well, as with many other musicians like Bjork and Agnes Obel. In the world of cinema there's Lars von Trier. When it comes to writing however, noone else comes close to Haruki Murakami. Kafka did well in depicting hopelessness, but it is not the same as subdued melancholy that Murakami is so accomplished in portraying through his mundane protagonists that are highly functioning in their day-to-day lives without much allusion to depression. One should not read his books for the plot, but for the pace, proses and analogies. In fairness I may not have read enough to discover other authors in the same vein. Perhaps I will get to the Russians one day and have my views changed on this subject. Once when I was on a solitary plane ride, I came across a documentary about Mongolian nomads. Strong men and women riding horses graced the screen herding sheep and goats, while children as early as adolescent age helped their parents astride beasts much larger than their small bodies. They wore colourful clothes that showed little influence from the outside world. Vibrant fabrics donned bodies - some lithe, some sturdy - of these weather-beaten descendants of what used to be one of the most formidable armies in ancient history. Though the focus of the film was the lifestyle of the nomads, I was deeply captivated by the clothes they were wearing. Their typical clothing consist of an outerwear called 'del' or 'deel', paired with loose trousers. They carry the same signifiers as the Western suits and jeans - denoting seasons, occasions, genders and tribes through the use of different materials and colours - that is, normal everyday clothes for their way of life. I was so captivated by the imageries that they inspired ROSEN's first collection in 2019. As someone who is far removed from a nomadic lifestyle, I admit I am completely ignorant on what being a pastoral nomad is like. I've never even been to Mongolia. I wanted to learn more about the people whose clothing culture has broadened my perspective on colours and textures. Further research into my source of inspiration yielded a less than romantic picture of the land of eternal blue sky. The idyllic documentary hides the harsh living environments that these herders face. Beneath their stoic exterior lies the hardships presented by modern challenges, from global warming that is affecting their livestock survival, to severe air pollution. Centuries ago, Mongolians had to worry about dying in wars or foreign invasions. Today, the post-Soviet country faces problems that were created within and outside of their control. Climate change has affected the livelihood of nomads. Shorter rainfall in summer means that less grass grows for grazing, and also less fodder to be stockpiled for winter. And then there's the harsh winters that are unique to Mongolia, known locally as dzuds. 700,000 animals perished in the winter of 2018. These include sheep, goats, cows, and horses. For reference, a small lamb can feed about thirty hungry footballers. A loss that large led to the complete obliteration of the income of several hundred families, with no hopes of recovery to their old livelihood. Altansukh’s milk pail stands empty. There is no horse for him to saddle. His cattle are dead. And this tent, which once stood in the countryside, is now on the fringes of the Mongolian capital, Ulaanbaatar, surrounded by pylons, rubble and the husks of old cars. 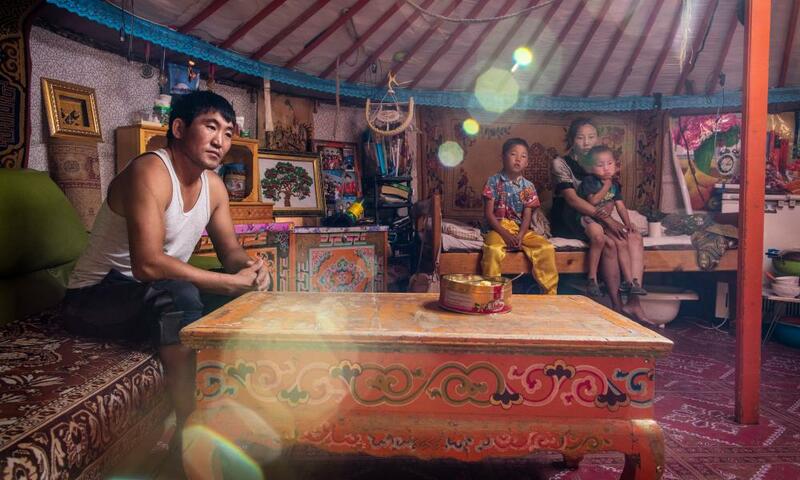 Altansukh, his wife and their four children may live among rural paraphernalia, but following a disastrously cold winter a few years ago, they were forced to move to the city to survive [...] “We lost all our animals,” the 38-year-old says. “Thirty-nine out of 40 cows, almost 300 sheep. The cows wandered far away in the snow and never came back. And when we got up one morning, all the sheep had frozen to death. We had lost everything – so we decided to leave immediately for Ulaanbaatar." Living in the capital city Ulaanbaatar provides access to basic convenience that we take for granted. City dwellers have access to running water and central heating. They don't have to relieve themselves in the outhouse at minus forty degrees - a temperature so low there's no need to discern between Celcius or Fahrenheit. Children can go to school. Public hospitals are within the vicinity. Yet for these newcomers, running away to the city presents new problems. When the country was run by a Communist government, immigration rate was kept under control so as to prevent overcrowding. But since the country has adopted democracy, such rules have been abolished. The city is now unable to cope with the large influx of rural migrants that had swelled the city three times the size of what it was planned for. Their addresses may have changed, but not their homes. Two thirds of the city's population live in traditional makeshift gers with no central heating nor plumbing. Some complained of the stress of city life, from the complete and utter dependance on monetary system for basic necessities, to lack of space. These temporal gers have no access to electrical heating system. In order to cope with winter in the coldest capital city in the world, they burn fuels in their indoor stoves. The richer ones burn coal and wood; the ones scraping by, tyres and plastic bottles. As a result, the city of Ulaanbaatar is now more polluted than Beijing in winter. Lung cancer is now a common disease. Babies develop respiratory problems within months of being born. Despite the increased likeliness of developing cancer, many are enduring the air pollution for as long as it takes before their children graduate with a university degree, working menial jobs as janitors, dishwashers and illegal coal miners. While there are a minor subset who prefers the convenience of city life, many longed for the freedom and fresh air of the undulating grasslands, the comfort of solitude, the slowness of time. To say that Mongolians are a tough race is probably an understatement. Schopenhauer would have a field day seeing their determination to endure life-threatening conditions for the sake of continuing our lineage. Beneath every picturesque image belies the struggles and hardships of life. The farmer worries for his animals; the metropolitan woman her crippling depression and anxieties. Life is all about deciding which cake to eat and mourning for the rest that we can't have. "I think it's best that you give me less work. This way I will be happier making clothes for you." The clock has just ticked over to six am. I have been awake for two hours, barely getting four hours of sleep yet feeling wide awake. Having given up on it, I put on Ryuichi Sakamoto and decided to pen down my thoughts that I have not had the chance to do in the longest time. My usual reading and writing morning routine has been usurped by work, or fatigue, whichever one is more pressing. In the week leading up to Christmas, I could barely sleep more than a few hours. Any time I wake up in the middle of the night, my mind is immediately tuned in to work. The last few months have been devoted to ROSEN-X, from designing, sampling, testing, shooting, and launching the collection. While all that was a normal process, I did not anticipate the level of demand that I received within the first two weeks alone (thank you for all your generous support). So much so that my primary "broker" - so-called that because this Jack-of-all-trades-but-master-of-none doesn't sew, he has a network of tailors he works with, compared to my second tailor who actually can do everything from pattern-drafting to sewing - complained of the amount of work I'm giving him, how complicated each piece was, and how overwhelmed with stress he has been. This was unprecedented. ROSEN-X 2.0 is undoubtedly more complex and substantial than the first collection. The trip to Guangzhou's textile market has proven useful. I now have access to interesting synthetics and treatments in unusual colours, some of which I have put to good use in this collection. Making clothes for colder months allowed me to use heavier membranes with added water-resistant properties. With that said, I have come to realise that stretch fabric is so much more comfortable to wear than heavy duty water resistant stiff fabrics. With all the fad for giant neon Gore-Tex logo slapped on every other streetwear brands, one wonders when the bubble will burst. Most people who wear these clothes need them for urban commute. A polyester membrane with 10,000mm hydrostatic head is quite an overkill for what we need in our daily use. For reference, a tropical rainforest receives an average of 2000 to 10,920mm of rain ANNUALLY. The UK Ministry of Defence considers 800mm to be waterproof. Moderate water-resistance against the rain, breathability, range of motion, and insulation in winters, would be more applicable for city dwellers. What I've noticed is that the crowd who wear technical clothing tends to fall into four categories. Those who wear them purely for utility, those who are obsessed with technical features but frankly don't need most of them, those who wear for the appearance of utility, and those who want clothing that bridges fashion and utility. In its purest sense, utilitarian garments are made for soldiers, construction workers, firemen etc. Within the casual context however, the ones who prioritise technically advanced clothing tend to be the outdoorsy-type like skiers, climbers, hikers and athletes. Waterproofness, stretch, breathability and durability of fabrics are extremely important to guard our fragile bags of skin, bones and liquids against forces of nature while allowing maximum range of motion. Fashion is less of a priority; the value comes from competitive pricing and advanced technical features. The North Face and Patagonia dominate this segment, and Nike for athletes. The second group loves to dork out on numbers - from water repellence to membrane pore sizes - taped seams and proprietary fabrics. Though I wouldn't consider it a bad thing, many fawn over branded textiles and overly-complicated construction without considering what one needs in one's daily lives, so much so that there is a tendency to overlook pedestrian synthetics and common cotton in favour of proprietary synthetics. Unless one is largely exposed to the elements on a frequent basis, this level of pedantry simply does not matter much when we spend most of our days traveling comfortably in climate-controlled vehicles. I call it the nerd approach. On a tangential note, the nerd approach is a buying behaviour that can be found in many other interests, be it Menswear, watches, cars. The third group is the most prominent group on Instagram. Scroll through the "techwear" hashtag and there will be endless images of young boys and girls strapped up from head to toe in a cacophony of loud branding, unnecessary zippers, webbings, oversized pockets, overly-designed bags that are supposed to denote edginess but frankly come across as mindless consumption. They strive to look as caricaturishly aggressive as possible. The appearance of utility is more important than actual utility. These youths - and the not-so-youthful - found themselves enamoured with a trendy fashion subculture that jived with them and combined it with the desire to take part in the game of one-upmanship - or in internet lingo - to flex. Any trend could be co-opted. Yesterday was Rick Owens. Today ACG. Tomorrow who knows. I call it the hypebeast mentality, in which fashion becomes a quest for validation to boost one's self-esteem. Many exhibit the same behaviour as a sneakerhead, collecting as many 'grail' pieces as possible, with the goal of showcasing the latest purchase in a 'fit pic' rather than how the clothes can enhance one's appearance. A telltale sign of this is the lack of attention in how clothes fit one's haircut, facial features and body shape. The fourth group may or may not have come from any of the prior three, who like the military and athletics-influenced aesthetics set in futuristic dystopia, but would like to look more presentable within their social environments. Many of them are fans of Blade Runner, Ghost in the Shell, Akira and William Gibson's novels. They take visual cues from fictions without being overly literal with their references. Clothing becomes less of a mask to hide insecurities that often manifest in consumerist one-upmanship games, and more of a tool to enrich one's existence, whether by increasing social utility, and/or reducing inconveniences. A water-resistant hooded jacket negates the need for an umbrella; a spill-resistant suit keeps one looking fresh after an accident at lunch. The clothes that infuse these technical properties are often adapted to typical everyday context, although this group may prefer a touch of aggression in its designs. It is a pity that the prevailing image of 'techwear' is largely based on Acronym and its derivatives. The brand itself is fine, it's the lack of diversity that is worth noting, especially when there are so many different approaches that early designs have spearheaded. If we look back far enough, Massimo Osti of C.P. Company was a pioneer designer who merged fashion with utility for use in urban setting. Then came a short-lived stint by a London-based label Vexed Generation who raised the issue of constant surveillance of the City of London pre-Internet 2.0, before anyone could predict that we would freely give our personal information to corporations. More muted options with top-of-the-line technical textiles have been available pre-Internet since the 80s and 90s, from Issey Miyake, Burberry, Prada to Zegna. The difference is that they do not market themselves as techwear, and do not possess the design language that appeal to younger people. Arc'teryx Veilance and Outlier do provide a minimally-designed, office-appropriate attire. To create a cohesive look from all these different brands requires some creativity, a challenge that doesn't seem to be taken up by many #techwear enthusiasts so far. I suspect the reason why #techwear as we know it today has been so one-dimensional is that the current iteration is still in its infancy, as shown by the sharp rise of interest less than two years ago. Many who stumble into the sub-culture gained their first exposure from social media. When the sources of inspirations are the same, so too will the end product. Social media are focused on visual cues; the guy with the most grails garner the most attention, either that or be an attractive girl. A girl with an out of place chest rig and ill-fitting jacket is a fodder for thirsty boys. The subculture that began as a practical approach to fashion lost its meaning and became a numbers game under the guise of aesthetics. Nike and Errolson Hugh knew this all too well. It shouldn't be a surprise that they released the Nike Prestos in the most eye-catching colours imaginable. This way they can grab the most precious commodity in 21st Century - attention. They clash jarringly with the muted colours that are utilised by Acronym and Nikelab ACG (with the exception of electric yellow that they produced recently). Many have fallen into their trap of collecting these shoes like they would with Pokemon - or rich women and gaudy Birkins - without considering how the shoes would fit their existing wardrobe. I can only wonder if people would buy these shoes in droves if they were released by some other brands. I write this as someone whose life and viewpoints used to be controlled by the clothes I wore. Leather jacket in 30 degress Celcius? Check. Ignoring the blisters forming in my uncomfortable designer heels? Been there. Refusing to admit that Geobaskets make me look like a dwarf? Yep. I've done all kinds of mental gymnastics to justify my faulty purchases. That is not to say that I have stopped making faulty purchases, especially considering the Rick Owens pieces sitting in my closet that barely fit into my lifestyle. At some point after many experimentations (which I firmly believe is an important part of growing up), we need to realise that we should look at clothes as another tool in the box of life, and not derive self-worth from the brands we wear. Ever since ROSEN was created, I have always used deadstock fabrics found in the local market. This place is by no means small, it has four levels that house a few hundred sellers. Generally there is no shortage of natural fabrics. My favourite sellers bring in imported wools and linens from Japan and Italy. It's also where I discovered the joy of Chinese sandwashed silks, a fabric that's far superior than cotton in terms of comfort, softness and breathability. However as I started experimenting with synthetic garments that focuses on utilitarian aspects for ROSEN-X, from fabrication to design, the options shrink to almost zero. I am extremely picky with the fabrics that I select. Comfort - this includes stretch and breathability - and tactility always come first. Water-resistance second. Since I am not doing the traditional route of factory production, certain production techniques are off-limits, such as heat-taped seams. So I carve a little nook for ROSEN-X that balances aesthetics with the simplicity of practical clothing. Despite the lack of options, I managed to produce a capsule collection by resorting to buying fabric samples online. However, with the growing popularity of ROSEN-X, I couldn't limit my designs to the few fabrics that I have used. So when I was invited to join a friend in Guangzhou for a trip to the fabric markets there, I thought it was a good time to head down south. Unlike the fabric market in Shanghai one does not get to walk home with the actual fabrics. The shops display their fabric samples that we can peruse and free colour swatches to take. Orders are made on the phone or on Wechat. The entire trading process is extremely informal, almost like buying from a relative. Chinese manufacturers are experimental with their linens, but from what I could tell, their main focus lies in more innovative fabrics such as viscose and tencel, that and synthetics that either mimic natural fibers, or are made into membranes. Eight hours and eighty fabric swatches later, I only managed to cover half the area, before my legs gave way. This is how bolts of fabric are moved around the fabrics district, from the warehouse, to the shops, to the courier stations. It was fascinating to see how different people have come up with different methods to juggle as many bolts as possible. And so on the third and final day - decked out in my favourite Rad Hourani vest - I had a better idea of where to go and whom to look for. Having sifted through hundreds of shops, I have my eyes on a particular synthetics producer run by a matriarchal Teochew family who knows what a three layer membrane is. It was a breath of fresh air to be able to speak to someone who is closely linked to the manufacturing side, rather than talking to young sales assistants who have been hired to man the shops without an inkling of what they were selling. Armed with close to a hundred fabric swatches, I went home ready to tackle the next stage of ROSEN and ROSEN-X.